Well, there's a joke around here and it's about me. My children always tell me that I go overboard with everything. Well, I guess that's a good thing where cards are concerned, BUT it's also a bad thing because I can't do simple. I don't know what it is, but it's almost like I become inept. I am really busy this month and so I decided to make a simple card. Well, this "simple" card turned out into an almost hour ordeal. First, I found this challenge: Hiding in my craft room Super Scraps Saturday #123 Perfect --since I don't have time to think and match paper etc. Well, as I started creating, oh my...everything went wrong. Maybe it's because I WAS using scraps and trying to be simple ??? But I kept cutting things crookedly. I have lots of scraps since I use 12x12 paper in hopes I can get at least 2 cards out of them. ACtually I never throw anything away, not even little teeny scraps...they may come in useful!. LOL. I even have an entire box of glitter scraps. 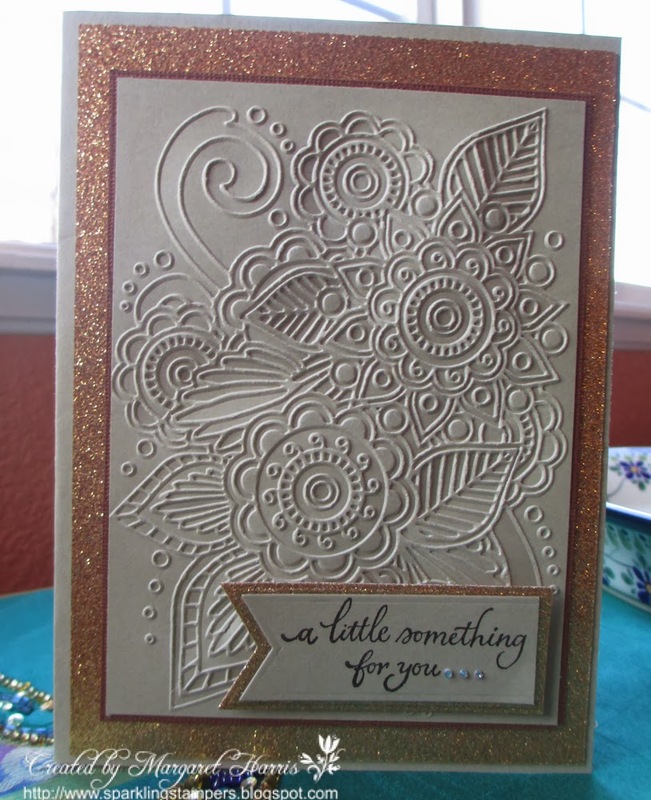 I used a Darcie embossing plate that Kathy gave me for Christmas. I LOVE this embossing plate. I first used it on white paper. Well it ripped. The embossing folder completely RIPPED IT! So then I had a big enough scrap of paper color I wasn't too crazy about--sort of neutral whereas I'm all about color. So this was a perfect opportunity to use it. It was thicker and that came out great but then the card I had well, was too big for this embossed piece of paper. So I found gold paper which I only had to cut a little. Fit great on the card except the embossed paper was still too small. So I found some brown paper. it was rather small so you can barely see it, mounted on the embossed paper. Once I mounted it on the gold...well you can see it's OK, but,...it was blah. And with my wonderful coordination, not sure it lined up perfectly. So then I thought of using a banner with what I had left. I think it came out OK, but not one of my prouder moments. 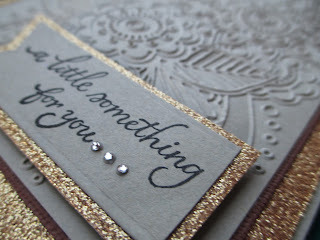 So, all in all..I really love this design of the embossed folder, but it was just not a high MOJO day for creativity. Which is why I added the gold paper...I figured it would give it some oomph. And the 3 swarovski's as a dot dot dot :) WEll I couldn't have it COMPLETELY plain! Oh my, Margaret, that is beautiful! I never thought of using an embossing folder as the focal point~great idea!!! I think your card is fantastic. I've been right there with you when I has some thin paper and the embossing folder tore it apart. Sometimes I've been able to save it for a Shabby Chic card. I never throw anything away, so I feel your pain. I am so fortunate to have this challenge so I can clean my desk area and make a fun card. Thanks for joining us this week at HIMCR and you will continue to visit our little blog. I'm with you! I keep scraps! And doesn't it feel good to make something with them! Your card is gorgeous! Thanks for joining us this week at HIMCR! This turned out awesome. I love the bling accents. Thanks for playing at HIMCR.